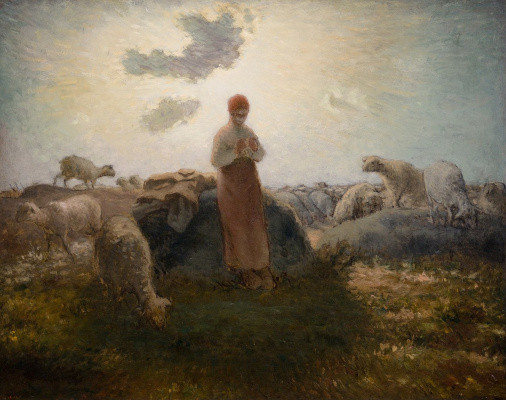 The life story of Jean-François Millet, a French realistic painter and one of the founders of the Barbizon school is full of myths. They served a good turn for his posthumous fame; even nowadays the word “great” is part and parcel of his name and his artwork the Angelus has been as famous as the Mona Lisa or La Gioconda for some time; Salvador Dali became obsessed by Millet's Angelus, which inspired him to paint numerous works. At the same time, the existing myths prevent from correct apprehension of the artist’s artworks making their sense much simpler. Van Gogh provided Millet with a powerful promotion, still working nowadays. 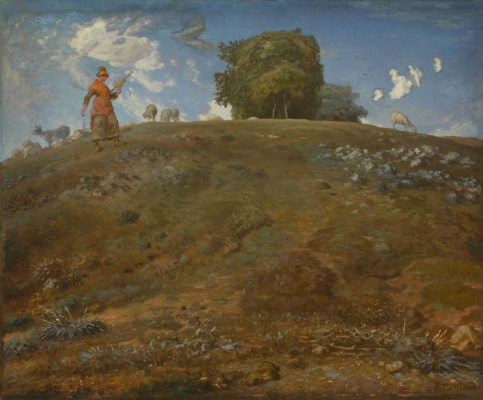 The Dutch artist was under profound influence of Father Millet’s oeuvre. 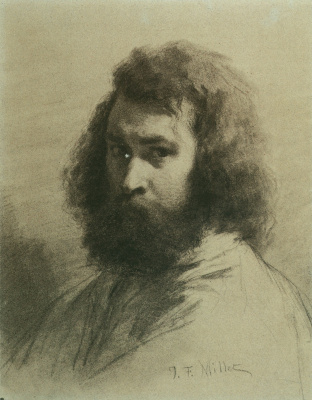 He executed a great number of copies of the Barbizon artist and tried to paint his own early paintings in dull earthy brown colors. 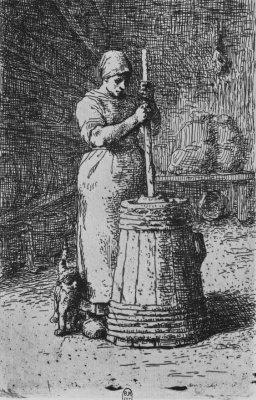 Moreover, Van Gogh tried to follow his way of life; his meals were poor, he rarely washed and wanted to be alike destitute peasants whom he had painted that time. The problem was that Van Gogh imagined the personality and the way of life of his icon based on the biography by Alfred Sensier, who was his patron and an art dealer, so his natural interest was to create such image of the artist, which could attract future buyers. 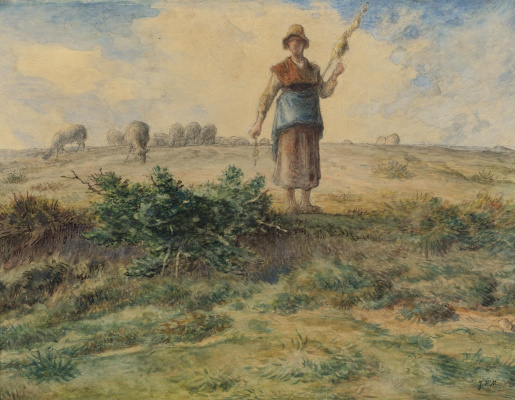 In his book, Sensier described Millet as a peasant son, who used to work in the field when he was a child and when he became an artist he came back to his roots and lived the same life as the subjects of his paintings. There were a lot of exaggerations and untruth there. 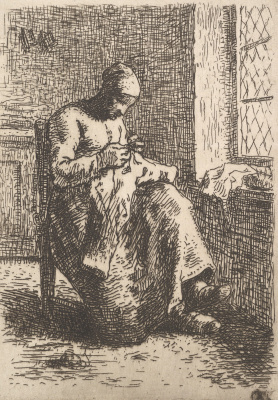 Millet was born to the family of an impoverished nobleman. No doubt, he could play with a spade in his orchard but a hard peasant work was out of the question. When he was a teenager, he read Aeneid by Virgil and paid no attention to the horticultural recommendations. He studied painting in Paris. 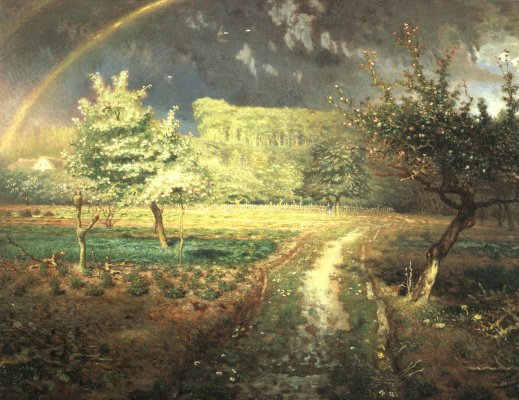 In 1849, he escaped to Barbizon because of a cholera epidemic that broke out in Paris. No doubt, he grew fruit and vegetables in his orchard for his nine children and the wife after they had moved to the village. 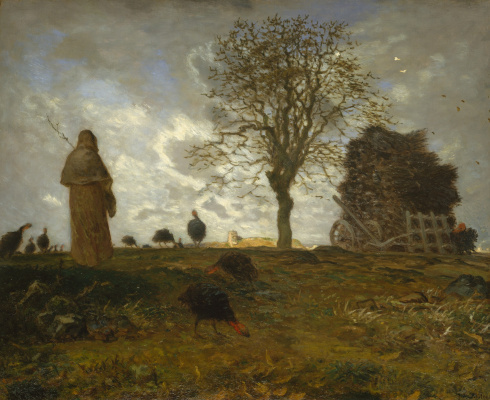 He was heavily in debt because each evening crowds of artists seeking typical rural landscapes in Barbizon were guests of his house. 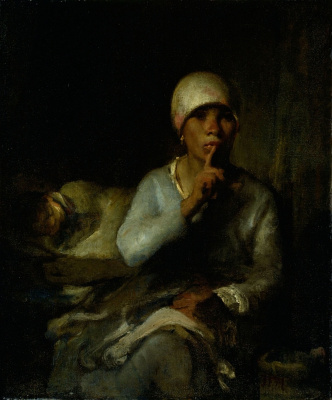 Millet painted in his studio on the studies he made in the open air. Walking in the forest he could grab a spade or scythe from a peasant he chanced to meet there just for exercises. It is enchanting but not sufficient for the Myth about Millet as a peasant living and creating only among farmers. The myth could result in primitive analysis of his artworks; an uplifting labor and modesty could hide the richness of spirit. 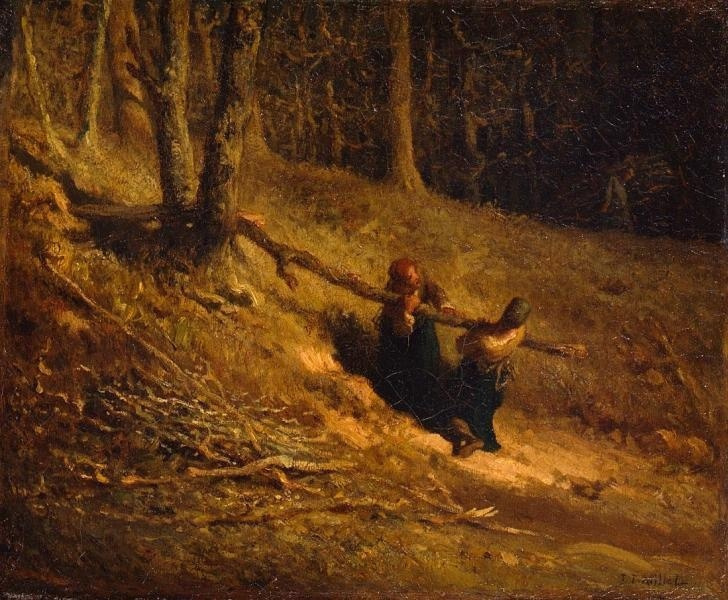 Actually, the artworks by Millet are much deeper. Millet’s peasants are always doing something; they are sowing, harvesting or just walking to their fields. They are an integral part of the nature, the same as seasonal changes or day and night. They work hard with apparent efforts like pulling the Earth to move ensuring with their simple labor constant succession of life and time. 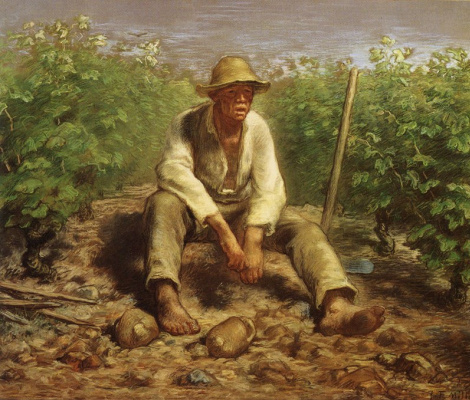 His artworks had nothing to do with cheap popular prints about happiness of a fair laborer. We can say that it is a philosophy. Was Miller an attention seeker and trickster? Did he pretend to be a peasant? Let’s say it smoother. Mythmaking. Diving into the offered circumstances according to Stanislavki. By the way, his peers noticed theatricalism of Millet’s artworks. That was not always complimentary. Renoir confessed that he could not stand Millet. The artist’s sentimental peasants resembled actors to Renoir. It’s up to a viewer what to see in Millet’s peasants. Such choice is sometimes enforced by an art dealer or the text in the Museum catalogues. Forget everything. Just look at it.